Think chalkboards are just for classrooms? Think again. Popular on Pinterest and adored by crafters, chalkboard paint can revolutionise an uninspiring table setting or transform a dull wall into a space of endless creation. Swot up on how to apply this gold star design trend in your kitchen. 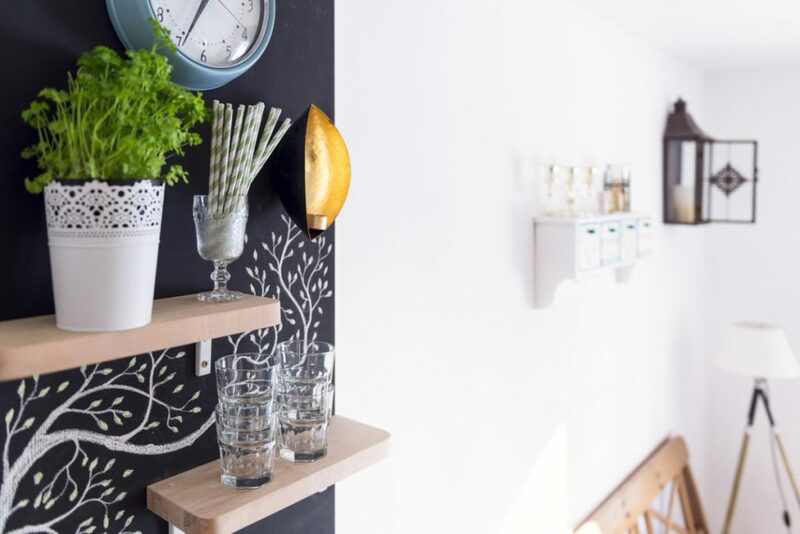 A chalkboard accent wall makes a top-marks alternative to a kitchen noticeboard! Incorporate a mail organiser, embellish with elaborate typography or coordinate the family by painting on a calendar. But, whatever you choose to do, make it your own. As a side note, although chalkboard paint is readily available at hardware and hobby stores, if you’re looking for a shade outside the traditional green and black, make it at home by mixing paint with unsanded tile grout. Can’t work out whether it’s basil or lemon balm? Prevent a culinary disaster by updating your herb gardens terracotta pots with chalkboard paint for easy to write-on and rub-off labels. Keep track of what’s running low by painting your fridge doors with chalkboard paint. This is a great move for preventing ugly, old refrigerators from becoming an eyesore, whether or not you decide to decorate your doors with love letters or shopping lists! Bringing together two major trends, chalkboard paint can add a little flair to glass canisters and help you keep track of snacks. Once the paint dries, chalk on what’s inside and its use-by date, then wipe off when the jar is empty. Prettify the decals by drawing on a few added embellishments. Step up your hosting game and cover your placemats with chalkboard paint. A step above crayons, they’ll keep the kids occupied at the dinner table, whilst adding a hint of school-days nostalgia to your soiree. Dreaming of a kitchen that’s as fashionable as it is functional? Then contact our Black Rok Kitchen Design experts or visit our showroom in Heathfield now.